New Yorker Abe Made The Connection Between West Coast And East Coast styles. New York City is known around the world for many of the great things that it has to offer, but lowriders are not among them! Well, believe it or not, Times Square can look almost like Crenshaw Blvd. 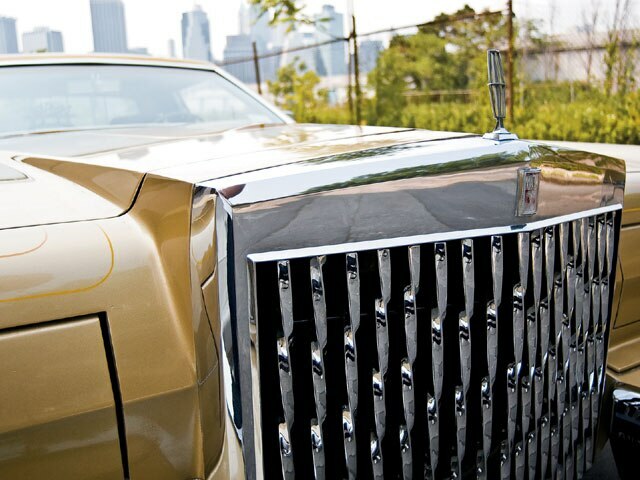 (if you catch it on the right night, that is) thanks to the many dedicated lowriders in the Tri-State area. 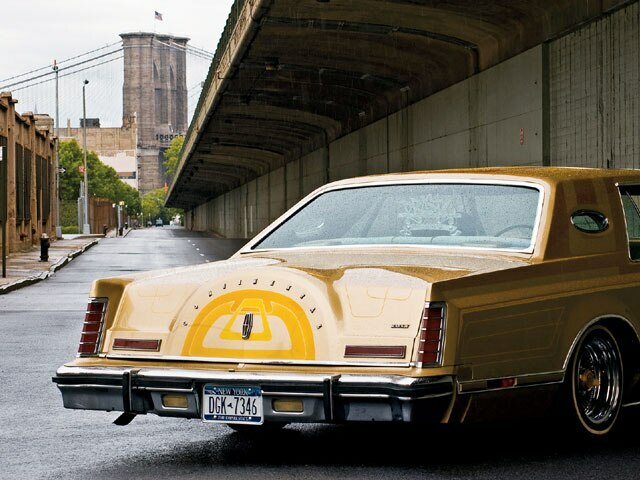 Because of cruisers like Abe Hernandez and his ’79 Lincoln Mark V, the “Big Apple” is sporting chrome and paint on their boulevards just like in California. Abe’s Lincoln has a lot of history behind it. The car was originally purchased by a member of a legendary Southern California car club, and Abe wanted to respect that. He first saw the vehicle at a show in Fontana, California, and then later learned through a friend that it was for sale. On a visit to Las Vegas, Nevada, for the Lowrider Magazine Super Show, Abe made a side trip to Cali to see the car again. He knew as soon as he saw it that it was the right project for him, and a deal was struck. Abe was now ready for the next step in this classic lowrider’s history. The ride was equipped with a low-laying hydraulic setup, but Abe added a set of accumulators to smooth things out for the rough streets back East. “Bear” at Sound Suspension in Pomona, California, gets credit for the hydro hookup. Abe didn’t want to do anything that would detract from the beautiful simplicity of the original body of the car, but he did want to put his own mark on his new Mark V. A custom grille was the perfect addition, so a quick stop to Mario’s Auto Works in Montclair, California, was the next step. Albert De Alba created a custom twisted steel bar grille, along with a completely custom split bumper up front. It wasn’t long before it was time to ship the car back home to New York, and when it got there it was definitely the smoothest looking ride in Jackson Heights, Queens. Abe loved his new cruiser so much that he couldn’t bear to park it just anywhere, so he rented a special garage across town just to house the ride. Engine/Drivetrain: Stock Ford 460-c.i.d. (7.5-liter), and with approximately 6 MPG, Abe spends more on gas than Wall Street investors put into Hedge Funds. Body/Paint: The paint has a hint of the funk from the ’70s, along with the smooth, clean feel of a contemporary spray. Jorge at All Autobody in San Bernardino, California, added House of Kolor patterns that include Pagan, Aztec and Inca Gold with mini-flakes. To follow along the smooth pre-1980 body lines, Jeff Roberts of Fontana, California, applied some beautiful pinstripes, along with elegant gold leafing. Albert De Alba at Mario’s Auto Works in Montclair, California, created a custom twisted steel bar grille, along with a completely custom split front bumper. Interior: Clean gold and beige velour complements the interior, and the seats were treated with gold piping as well. The OG interior is Abe’s home while cruising around West 4th Street and 6th Avenue on the weekends. Sound System: Abe put together an all-Pioneer sound system including 6-inch speakers up front, 6x9s in the back, and a set of woofers, all connected to a four-channel amp. Setup: A “V-Max” setup was installed by “Bear” at Sound Suspension in Pomona, California. Because he only wanted to lay low, all that Abe needed were two all-chrome pumps with four chrome dumps powered by six Trojan deep cycle batteries. To keep things nice and slammed, a pair of 3-ton springs were used up front with 10-inch cylinders to lift the Lincoln over potholes.